Killer on the loose: Nookie Assassin in the shop! 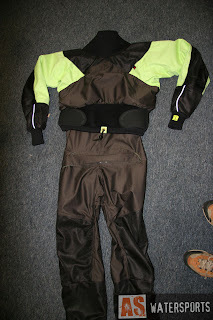 The Killer new Drysuit from Nookie, The Assassin, has arrived. As we've already mentioned in previous posts, the Assassin is an amazing looking and feeling drysuit. Built from Tough and breathable fabrics, and with Brass coil BDM zips, the Assassin is packed stunning features. It's also hand made in the UK, with environmentally friendly fabrics, so it doesn't just look green, it is green! 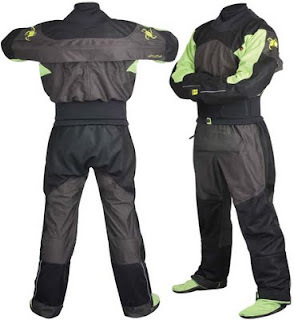 You can buy the Nookie Assassin Drysuit now through our web shop by following this Link. You can also check it out on Nookies Website Here. In a country where whitewater paddling is more or less dictated by the rain, knowing what the rivers are doing and how much rain has fallen can really help you to decide where to go to get your whitewater fix. Our water levels web page has been expanding recently. We now have links to even more web cams, for a live view of local river levels, as well as links to online weather station, two on Dartmoor, and one on Exmoor, to make it even easier for all you Whitewater fans to check the river levels, and rain fall amounts. 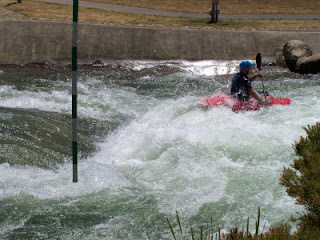 So why don't you check out our new look water levels web page on the Main AS Watersports website. There are now 5 webcams on four different rivers, and 3 online weather stations. It feels like we've gone a bit surf crazy here at the moment! Firstly Jim has bought himself a new surf kayak, and secondly we seem to have a big selection of second hand surf kayaks all of a sudden! After trying and loving the shops demo Valley Rush 7/2 Jim decided to go all the way and buy one for himself. Jim went for a clear gel coat with metal flake, and black fade. All in the Vac bagged Ultra kevlar spec. The guys at Valley reckoned the shell weighed in around 9.5kg! Super light, super stiff and great looking. Bring on the Hurricane swell!! 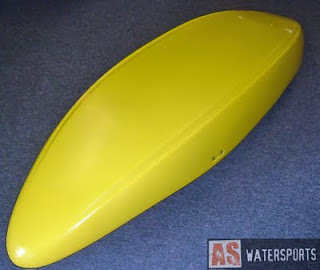 For more details on the range of Valley Surf kayaks check out our Valley Surf Kayak web page. 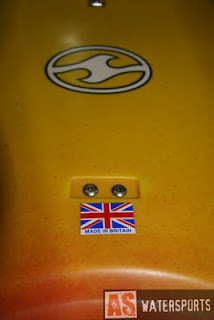 Mean while on the second hand front we have a great selection of surf kayaks. We have several Plastic models, as well as a full carbon kayak, and a carbon kevlar kayak, and if that's not your cup of tea we even have a great looking wave ski in as well at the moment. 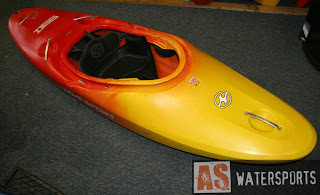 You can check them all out on our second hand kayak web page. Last year we helped a previous customer get a new Pyranha Rev. So what you ask, well we only had to get it to Australia! Below is Ian enjoying his Rev at Penrith WW course in Sydney Australia. A. S Watersports, your local international kayak shop. Another week, another exciting new delivery! 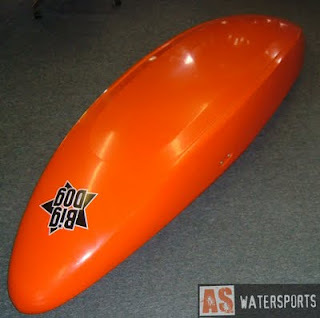 This time its some shiny new Big Dog kayaks. We've just received the Force and the Flux. 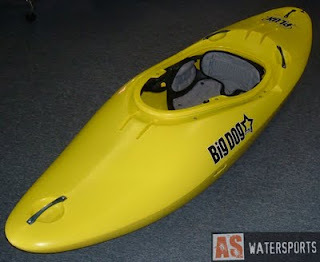 Two river running kayaks from this new manufacturer. First up, the Force. The Force is designed as a river runner/creek boat. It features a semi planning hull, mixed up with bags of volume. A peaked deck aids predictable re-surfacing and a long water line helps to generate loads of speed when you need it most. It has 5 tough alloy grab handles/attachment points, and a tough and stiff rotomoulded seat and bow pillar combo, and a full plate footrest, all finished off with a comfy ratchet adjustable backrest. And best of all, you get all of this for just £699! Then we come to the Flux. The Flux is a great all rounder, featuring a full planning hull for play performance, but with enough volume to make it a true river runner. Ideal for paddlers who want just one boat, it will enable you to paddle hard whitewater, but still play, surf and spin all the way! It features four tough alloy grab handle/attachment points, a tough and stiff rotomoulded seat, a full plate footrest and of course a ratchet adjustable backrest. And you can get all this kayaking goodness for just £649! So why not pop in the shop and check out, or even try out these exciting new kayaks, form this exciting new kayak manufacturer. We've been having a tidy up in our warehouse and have found a selection of boats that are either Old models, Shop soiled or just in the way! 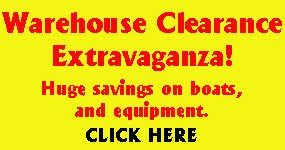 So we've put together a Special Warehouse Clearance Extravaganza sale. Now your chance to get yourself a Kayaking bargain. So take a look and see if there is anything you fancy. Christain is pretty stoked about his achievement. Finally Christian Hosie has been presented with his Guinness World Record certificate for being the youngest person ever to cross the English Channel by kayak. If you would like to hear more about this acheivement then get your selves along to the South West Canoe Show 2009, SAT 3rd October and listen to the brothers talk all about it. See our other blog posts for the whole story. Our Preparation's for this years South West Canoe Show are continuing, we have more and more people confirming their attendance, and lots of new products being lined up for display. Square Rock, the UK importers of Jackson kayaks, have confirmed that they will be here, to show the all new 2010 range of kayaks. System X, one of the UK's biggest and busiest importers will be here with a vast range of new, interesting and exciting products from : Sweet protection, Werner, Astral, Liquid Logic, Native watercraft and many more. 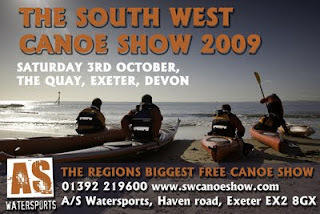 For all the latest news on the 2009 South West Canoe Show, check out the dedicated South west canoe show website here. The web site is regularly updated, so don't forget to keep checking for all the latest news and information. Jim and Ewart have been out and about paddling, surfing and other things. Check out the GoPro head cam footage Ewart took of surfing a "ducky" inflatable kayak last week and Jim's hot wave ski shreding at Saunton. Also a picture of the new Dagger Axiom in action. We've managed to get some spy shots of the all new Nookie Assassin suit. Steve Whetman dropped into the shop earlier today to show us Nookies newest piece of paddling kit, the long awaited Assassin dry suit. The first thing we noticed was the fantastic fabric. The Assassin is made from 3ply Bamboo herringbone fabric with Enduro mesh reinforced shoulders, elbows, wrist cuffs, ankle cuffs, knees & seat. The Herringbone pattern fabric not only looks super cool, but is soft and flexible, as well as tough, warm and breathable. The Enduro mesh is tough, it was originally designed for motorcycle protective clothing, yet it too is also soft and flexible. 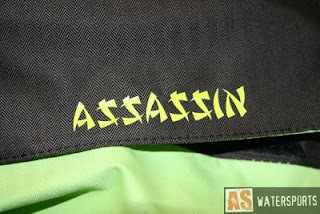 The styling is top notch too, the herringbone fabric looks great in contrasting dark grey/brown and lime green, topped off with cool new Assassin Logo and text across the shoulders, as well as reflective piping, and subtle touches of colour under the zip covers and around the waist draw cord. The Suit features tough and very water tight BDM Brass coil zips, both across the shoulders and the front relief zip. Both zips have two tone covers to protect not only the zips, but also your kit from the teeth of the zip, the zips also have built in tags to help you open and close them. The neck features a latex seal, with outer neo "O"ring cover as do the wrists, and your feet are enclosed in more herringbone fabric socks. The waist comes with Nookies OPUS system for a great snug fit and an excellent seal with your spraydeck. The Assassin is due to hit the shelves on the First of September, just in time for the winter paddling season, and just in time for the South West Canoe Show 2009. 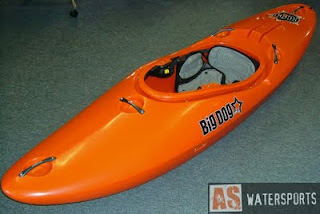 Fresh on our website this week is this stunning Canoe package deal. The Pelican Potomac is a great family friendly Canoe that is ideal suited for relaxed paddling on calm waterways. Perfect for cruising along canals, slow moving rivers, lakes and sheltered estuaries. It's manufactured from tough co-extruded ram-X plastic, and is finished off with tough vinyl capped aluminium gunnels and plastic seats. We're selling them with two TNP Canoe paddles, all for just £475. Freshly unwrapped in the shop this week, we have the revamped, renamed and relaunched Wavesport "D" 65 and 75. 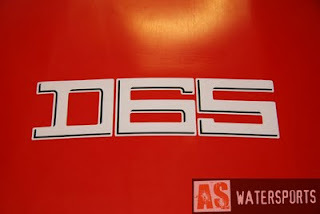 The "D" is a refreshed version of the original Wavesport Diesel. It keeps all the original hull and deck shape and features of its predecessor, but with new cockpit fittings and a new Price tag, of just £699. The original Diesels were an instant success when they were first launched. 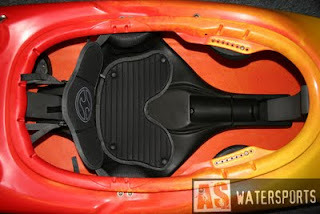 Featuring a planing hull, rails and enough hull length to make it a fast, stable and easy to paddle kayak, it also has enough deck volume to comfortable run whitewater upto grade 4. They were a hit with a wide range of paddlers, improvers, whitewater novices, coaches and seasoned paddlers who wanted to have fun on the river, but hit the odd creek as well. The first big difference is a little label that says 'Made in Britain'. The New "D" is molded under licence in the UK. This helps keep the price down and reduces the boats carbon footprint, as it's no longer shipped across the Atlantic just to be here! The next difference is the internal fittings. It still features a tough and stiff rotomolded seat and a robust full plate footrest, with two sized footpods. The biggest difference is the thigh braces, they still feature the same leg hugging security of the originals, but are now molded out of one piece of plastic, they also feature heaps of adjustment to find the perfect fit. 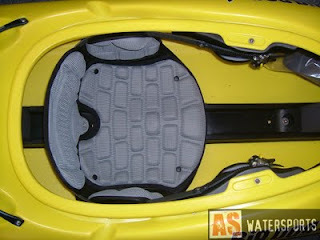 The other difference is the backrest, gone is the original ratchet adjustment, to be replaced with a simpler, but equally comfy and adjustable whitewater backrest. The new "D" is still available in two sizes, the 65 and the 75. The smaller of the two, the D65, is suitable for paddlers upto about 90kg and about 5'8", and the bigger D75 will fit paddlers upto about 110kg and 6'+. We currently have both sizes in stock. 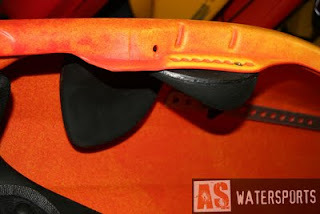 You can check out some info on the wavesport "D" on our website. Or pop into the shop to try one out.